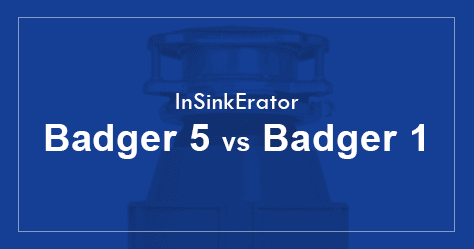 Badger 5 and Badger 1 garbage disposals by InSinkErator are very similar except for a few things. While going through their specs people always get confused about which one to buy. I can’t blame them because the specs of both disposals are so close, and they even look the same. This is a humble attempt to point out the similarities and differences between the two models. Both of them are of the same design, same color combination and the same build. Both disposals have a chamber capacity of 26oz. Both have galvanized steel grinding elements and stainless steel swivel lugs. Both run on Dura-drive induction motors at an RPM of 1725. They are continuous feed type disposals with a single grinding stage (Top models of InSinkErator have multiple grinding stages). As both are budget disposals they don’t have any high-end noise insulations but they will do just fine. The most notable difference between these disposals (other than the stickers on their body) is the motor. Badger 1’s motor has a power of 1/3 HP whereas Badger 5 uses a 1/2 HP motor. That makes the latter almost 50% more powerful than the other. Also in terms of dimensions, while the chamber capacity is 26 oz for both, Badger 5 is slightly bigger owing to a slightly bigger motor. That makes it a little bit heavier too. Another notable difference between them is for warranty. Badger 1 has only 1-year warranty whereas Badger 5 comes with a 2-year warranty. Can I replace a badger 1 with a badger 5? Definitely, you can do that and vice versa. The size and specs of both disposals are almost the same so you can easily replace one with the other. You can use the same power cord too. Badger 5 has better specs and warranty than Badger 1. As you guessed the former is more costly than the latter but the price difference between them is only a few dollars, sometimes just 10 bucks. I will definitely go for Badger 5, what about you guys? Let me know in the comments.